TORONTO, ON [1 June 2015] – By observing galaxies billions of light-years away, a team of astronomers has detected tube-like structures mere hundreds of kilometres above the Earth’s surface. 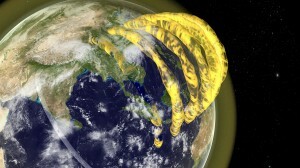 “For over 60 years, scientists believed these structures existed but by imaging them for the first time, we’ve provided visual evidence that they are really there,” said Cleo Loi of the ARC Centre of Excellence for All-sky Astrophysics (CAASTRO) at the University of Sydney and lead author of a paper published in Geophysical Research Letters last week. The astronomers—including Prof. Bryan Gaensler, former director of CAASTRO and the current director of the Dunlap Institute at the University of Toronto—made their observations with the Murchison Widefield Array. The MWA is a radio telescope in Western Australia designed to observe the early Universe and distant galaxies, as well as stars and nebulae within our own Milky Way Galaxy. As light from a galaxy passes through layers in the Earth’s magnetosphere, the light’s path—and hence the galaxy’s apparent position—is altered by variations in density in the layers. The effect is like looking up from the bottom of a swimming pool at the distortions caused by waves on the surface. Mapping the variations in the positions of multiple radio sources over the course of a night revealed the shape and dimensions of the tube structures. As well, by exploiting the MWA’s rapid “snapshot” capabilities, Loi and her colleagues created a movie—effectively capturing the real-time motions of the tubes. In addition, the astronomers made their observations using the east and west halves of the MWA’s array of antennas as separate instruments. “This is like turning the telescope into a pair of eyes, and by doing that we were able to probe the 3D nature of these structures and watch them move around,” said Loi. The observations revealed that the tubes above the MWA are 500 to 700 km above the surface and are aligned with the Earth’s magnetic field. The tubes are at an angle to the surface because they follow the field as it angles down into the planet.